Do you work for PyCharm? Learning about PyCharm? We can help. "Best IDE for Python development"
The best thing which I like about this IDE is that it has wide array of plugins which I have used for developing the application faster and better way. It has in-built support of version control system like Git which helped me a lot in executing Git commands easily. It has very good conflict resolution tool which is really helpful to me because I am working in a team. It has in-build database support. Moreover, debugging the application is very useful. It takes a lot of memory to run. Due to that, sometimes it slows down when you have so many files are loaded into IDE. Apart from it, there is nothing much which I don't like about it. If you are Python developer then this is the best IDE available in the market. If you have money concern then you can use it's community edition as well. I am using this IDE for the development of web application in Python language. It really helped me in making the application better way. "PyCharm works like a attraction!" Also, it's far a chunk heavyweight, in particular if you want to edit a single record In the visible issue I locate which you have too many options in sight, which overloads the view whilst you are programming and can distract you, despite the fact that the total screen mode allows to do away with this hassle It also makes it to consume an crucial amount of ram. "Best and powerful IDE for Python development"
The best IDE available for Python development. The best thing which I like about is it's vast array of plugins which helped me in developing the application faster and in better way. Debugging the application is very easy and fast as well. The most important thing which I like about it it's support for version control system like Git. It has a very good support of Git and you can easily execute Git commands through this IDE only which is very helpful for me because I don't have to use another Software/Git client tool to execute it. Apart from it, it has very good support of unit testing frameworks. It has a very good support of Sqlite database which is very useful while developing the application. It takes a lot of resources to run the IDE completely. Hence sometimes it hangs or freezes and you need to restart the IDE. One more important thing is if you want to use it's professional edition then it's bit costly. But it's community edition solves all my problems only which is free. I would totally recommend this IDE if you are developing the web application in Python only. I have been using this IDE for the development of web application in Python. It helped me in developing, debugging and writing the unit test cases of the application faster and better way. "One of the Wholesome IDE for python programs development"
If you are looking for GUI based IDE for python, Pycharm is the way to go, I would highly recommend pycharm to my peers in the student community. I am an undergraduate student and use python to code up my implementation my personal projects. Pycharm is the primary IDE I use as it can complete all the requirements of goto definition and code suggestions. This makes my deployment faster and more robust. "Very comfortable experience, I would not look back!" It actually helps you to develop Python software following the best practices there are. It has integrated checkings with PEP-8, so your code will be easily understood by other developers. The profiler is good and the debugger is really easy to use and understand. Setting up a proper test environment in your running configurations with a battery of tests is also easy. The default settings are good, but if you really want to adapt it to your needs you'll need to dig the Settings panel a bit, and with the number of configurable settings this can be a daunting task at first. Once you get used to this, back up your configuration file so it can be imported later in another setup if need be. Use first the Community edition. Fully understand the ins and outs, then you can go with the Professional one. Doing it this way will allow you to realize the maximum benefits of the product. Faster development times, faster bug hunting processes. An actual implementation of best practices with the help of how the IDE is setup. "improve python code quality and devlopment"
For the past two years, I've been using PyCharm almost daily and it was anything but perfect. For scientific work, the integration of IPython notebooks and packages such as Matplotlib and NumPy (also supported by Anaconda). I also like the fact that PyCharm offers intelligent code completion, code inspections, mistakes and fast fixes. One thing I don't like is that much RAM (8 GB) is needed. It's difficult for my computer to have only 8 GB RAM. 16 GB of RAM is recommended. The startup time of PyCharm is also slower than for software such as vscode. Remember, the price is high. Another thing I do not like about the software is that remote debugging can be very unstable and it is very frustrating when the debugger freezes after hours of work. Get to know the shortcuts, they can be used for any Jetbrains-IDE. Switch to PyCharm, I bet you won't regret that decision. I'm very happy and productive with PyCharm. You can test the trial version and purchase the Professional version if necessary. I use Pycharm to analyze big data. Pycharm improves development time and reduces error numbers. It has good and fast features that can be used for fast prototyping applications. The Git integration works with our Business Git. Best software to debug (pyhton) code, I found so many bugs in little time. It does easy step by step debugging with a nice GUI. "Easy to use and Great debugging options"
I have used PyCharm for the last 2 years and it has been nothing but perfect. I have been able to get good suggestions, resolve dependencies, jump across my code and at the same time make sure to implement unit tests and browser automation. It greatly reduces time in non-code related things and lets you focus on just implementing your logic. Plus there is a great community support. There is not much to dislike apart from the fact that if too many Pycharm windows were opened, a lot of RAM was used and sometimes, only rarely, Pycharm crashed and I needed to do a system restart. But this was only when I abused my systems by running many heavy jobs. Look into your memory usage! While working, I was using Pycharm to create my Python and Yaml scripts for automation. Also, used it for checking my Flask errors and implementation. Incorporated MVC framework using PyCharm. "Pycharm proporciona autocompletado y mejor GUI"
Mi característica favorita de PyCharm es la autocompletación para bibliotecas de terceros. Me ha ahorrado una ridícula cantidad de tiempo al poder ver funciones y parámetros disponibles, especialmente cuando se trabaja con una biblioteca externa como Qt (PySide) para realizar trabajos de GUI. También es ideal para trabajar en proyectos, ya que organiza archivos en su propia carpeta, cada uno con su propio archivo de proyecto como cualquier otro IDE popular. PyCharm también es compatible con el resaltado de sintaxis, la corrección ortográfica, las comprobaciones de especificación PEP-8, el plegado de código y la indentación automática. También tiene una ventana integrada de depuración y registro, que es ideal para localizar errores y verificar resultados. ¿Mencioné que también es gratis? Sip, pruébalo. A veces solo quieres trabajar en un único archivo sin un proyecto, lo cual es posible, pero no es tan sencillo como podría ser. La interfaz puede ser un poco confusa al principio, pero pronto se dará cuenta de que probablemente no necesitará tocar la mayoría de los botones y menús que presenta. Consideraría usar PyCharm si quieres un IDE rentable para un desarrollo de Python rápido y eficiente. El código de escritura se hace 10 veces más fácil con la compatibilidad de autocompletado de la biblioteca de terceros, ¡algo con lo que no me gustaría vivir! He utilizado PyCharm para construir el marco de prueba basado en python y el IDE para nuestro producto de software principal. Sus características me han permitido prototipar rápidamente y construir un sistema de prueba funcional en menos de 6 meses. "PyCharm Makes Development An Enjoyable Experience"
1- PyCharm integrates IPython Notebook which is very useful for modifying the tabular data. packages including Matplotlib and NumPy. 3-It is also good for full-stack web developers because it provides facility to develop the frontend, backend, and Database. 4- Access Oracle, SQL Server, PostgreSQL, MySQL and other databases right from the IDE. 5- PyCharm provides smart code completion, code inspections, highlighting errors and quick fixes. One thing Only I dislike is that it requires a great Ram like 8 to 16 GB. It is heavy for my computer because I have only 8 GB Ram in my laptop. I would widely recommend it to other python developers because It makes the code more efficient and having the all functionality which I needed. It has wide plugins which give the facility of developing multiple languages applications on a single IDE. A mchine learning and Datascience enthusuiast can develope it's projects on it .He can visualise the data and make the plots using plugged libraries very efficiently. For my use case here are some of the features that I think are best and were useful to me. Firstly, PyCharm features an excellent debugger. For someone who debugs his code often. It's very easy to dig through to code and see what is happening. Stopping and a break and seeing what variables contain at that point and make the debugging process easier. Secondly, I have two workstations one at home and one at the office it allows me to sync my profile settings between instances. Making the change from Home workstation to Office workstation and back very seamless. Third and last I change between my workstations often. Hence the remote development feature was very compelling. For me, this provides the ability to a script on an instance in the cloud. Along the same lines, I can select an interpreter which is a docker container. The remote development feature was what the deciding point to pay for the license. Otherwise, I would have probably stayed with Community Edition. I have been using the Community edition for quite some time and am very pleased with the features and support that comes with it. There is Professional Edition too which is paid and has a lot more features. I bought the Professional Edition recently since I am now used to IDE well. I would definitely recommend using PyCharm and for beginners, I would ask them to do as I did and go for the community edition first and then to the paid version. For professionals who need a one-stop IDE for Python then look no further than PyCharm.However, if the price is an issue for anyone then I would recommend to look for other free IDE like Spyder, PyDev or go for the community edition you will not be disappointed. "PyCharm excellent for web development"
Here are some features that I think are best as per my use case. It has one of the if not the best support for Django. However, it also provides good support for Flask, Pyramid,Google App Engine, and more. It also supports integration with IPython which I use to share my code and documentation with other colleagues. It allows for Remote Development by providing built-in ssh terminal, Docker and Vagrant connections. I have used this product for past 4 years and its a good product.There is nothing that i don't like about PyCharm. Being a web developer who uses Python I would definitely recommend using PyCharm. It's one of the best IDE available on the market for Python. It's however paid so I would recommend to do some research and choose IDE that it's ideal for you but if you decide to go with PyCharm you won't be disappointed. I work as a web developer. Most of my work includes building web projects using Django. The reason I use PyCharm is that it has built-in Django support the best I have ever used. I wanted an IDE that has comprehensive support for Python and Django and PyCharm provides me both.It provides me with excellent debugging tools and plugin,Git integration and GitHub integration. "Best python IDE which can beat all others"
Thousands of plugins, integrated terminal, version control, python console that has an autocomplete function and auto-suggestion when you need to quickly test a function. Search/jump to a function, class or module with simple keyboard shortcuts. It shows you the PEP-8 recommendations as you code. Easy code refactoring and much more. I can not go back to the Python code without PyCharm, this IDE is definitely for the best to develop in Python congratulations JetBrains, all your products are the host, the ease you give to develop is appreciated and much. Inability to execute a part of the code in another that is not the regime of the console, inadequate support in the installation of third-party plugins, sometimes I have difficulties to install transfer plugins to use in the other IDEs. I would highly recommend PyCharm to anyone considering a large-scale or medium-scale project. I still use PyCharm to create the python-based test framework. Its features have allowed me to quickly create prototypes and build a functioning test system in less than 6 months. "PyCharm from a Data Analytics View"
There are a whole lot of features of PyCharm not all can be mention. However, there are some features which I like the most. It works great with Python distributions like Anaconda and WinPython. It's very easy to set up if you have already installed Anaconda or WinPython.It offers great pip integration. Provides great sophisticated static analysis tools. It provides excellent integration with debugging tools which are one of the best available in the market. Using PyCharm for over 3 years I have found nothing displeasing about it. except for slow loading time which is usual for all the IDE when they first load. Also, there is one more thing to keep in mind the price, it's expensive. It's great for data analytics due to the debugging tools allowing you to step into any part of your process. It worked well with Anaconda. However, I would definitely recommend PyCharm for machine learning, web development or data analytics etc as well. For beginners, I would recommend them to go for the Community version of PyCharm or Spyder or other alternatives to start with Python programming and then shift to a Professional version of PyCharm cause it's expensive to start with but it's worth the price to pay for all the features and supports that comes with it. I use Pycharm for big data analytics. Most of my work involves data scraping, traversing and converting. It works well with Anaconda and I could visually inspect data frames. 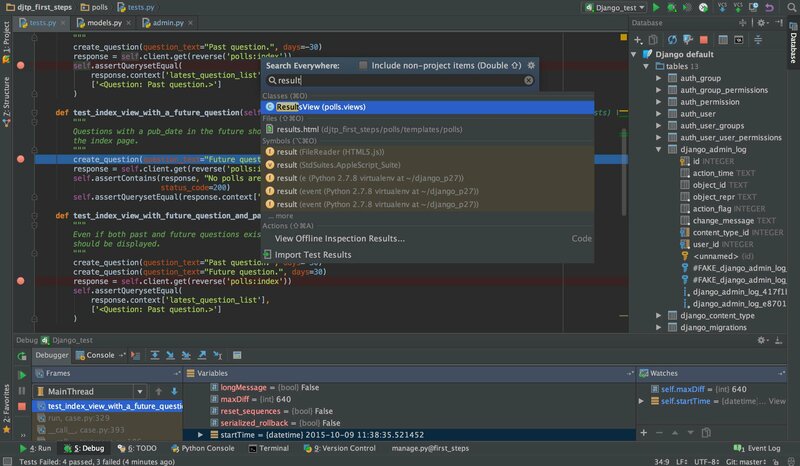 In all, I needed a comprehensive IDE for Python to utilize good debugging tools and plugins managers and a one-stop shop to take care of all Python dependencies and PyCharm is the IDE I was looking for. Our productivity with coding in Python increases quite a fold when using PyCharm which has alawys been the aim of all JetBrains product. The best thing is even though it is not an open source software, it prvides free pro version for students who can produce enough evidence that they are studying. This helps students to use professional grade software even before they join companies like us for their career. Thanks to Jetbrains for introducing such software for development! The size is a bit too much! There are a lots of features which could have been included as extra add-ons or extensions or something of that sort. Other than that, it's perfect. If you like any other Jetbarins IDE, you will definitely like this. Go for it! "Python IDE for Novice to Expert Developers"
PyCharm is an all in one Python IDE. It provides all Python tools in one place. It allows you to have per database colors.If you are security conscious, Pycharm supports connecting to SSH servers that are protected with google authenticator. Pycharm also supports connecting to Jupyter notebooks on a shared server. PyCharm also has an intuitive and interactive console that encourages new developers. A built-in terminal is also provided. The PyCharm debugger is 10 times faster using the new framework API. It ignores files lead to no test found hence it provides clean output. Pycharm allows you to run a test or a suite with an inline icon. Passing and failing tests are decorated with green and red gutter icons. The new updates in Pycharm support for the latest Django flasks and pyramid plug-in available for view GF support. It provides autocompletion of code and can generate import. Pycharm menu system is terrible. Impossible to run multiple projects at one time because of the large resource utilization. PyCharm is a great IDE for developers because it has almost all the tools available in it. It provides fast debugging and passing and failing tests are decorated with green and red gutter icons. Switch to PyCharm, I bet you won't regret it. The software is available for Windows, Mac, and Linux hence you don't have to change your OS for PyCharm. It allows me to use my license on multiple machines which I like the most. I use PyCharm for data visualization and analytics and plotting various graphs. "Best IDE for Python Projects"
So many features, great amount of functionality, easy use of interpreters, best for big projects, Ideal for usage. There is nothing to dislike about it, but if your laptop is not high end then it would take a lot of time to open and run as it takes considerable amount of ram. But if you want the functionality it is the minimum trade off. Just the best one out there in the market. just go with it for doing big projects and python programming and also statistical analysis. PyCharm knows Python. My favorite best feature is Control-B which jumps to the definition of whatever is under the cursor. PyCharm has built-in support for Django. This includes things like the syntax of Django templates and being able to run and debug Django app in PyCharm. PyCharm has git repo support and has a lot of useful features related to that like adding files in the repo, showing changes since the last commit, comparing a file to any other version of itself etc. Admittedly, the documentation is sparse compared to, say, Django. There seems to be a lot of it on their support website, but when you start to use it, you realize that most pages only have a paragraph or two that only touch on the surface of things. Some relatively basic functionality requires paid license. I'm not saying PyCharm is better than everything else. What I can say is that I'm very happy and productive using PyCharm both at work and at home, and if you're dissatisfied with whatever you're using now, it might be worth checking it out. Being a web developer I use PyCharm for website development using Django. It has built-in support for Django. This includes things like the syntax of Django templates and being able to run and debug Django app in PyCharm. I started using PyCharm since I was switching between Linux at work and Windows at home.PyCharm works the same on both due to Cross-platform support. Because the git support is so handy, I sometimes use PyCharm to edit files in projects that have no Python code at all, like my personal dotfiles and ansible scripts. "Bestial IDE para desarrollar en Python"
Miles de plugins, terminal integrado, control de versiones, consola python que tiene una función de autocompletar y auto-sugerencia cuando necesitas rápidamente probar una función. buscar/saltar a una función, clase o módulo con simples atajos de teclado. Le muestra las recomendaciones de PEP-8 a medida que codifica. Fácil refactorización de código y mucho más. No puedo volver al código en Python sin PyCharm, este IDE sin duda es para el mejor para desarrollar en Python felicidades JetBrains, todos vuestros productos son la hostia, la facilidad que dais para desarrollar se agradece y mucho. incapacidad para ejecutar una parte del código en otro que no sea el régimen de la consola, soporte inadecuado en la instalación de plugins de terceros, a veces tengo dificultades para instalar plugins de transferencia para usar en los otros IDEs. Recomendaría encarecidamente PyCharm a cualquiera que esté considerando un proyecto de gran escala o de mediana escala. Sigo utilizado PyCharm para crear el marco de pruebas basado en python. Sus características me han permitido crear rápidamente prototipos y construir un sistema de pruebas de funcionamiento en menos de 6 meses. Custom keybindings have come a long way, but without a mappable leader they still work more like they do in Emacs and Sublime Text than in Vim. I don’t want to use backslash as my leader key, so I still end up combining Control, Command, Option (or Alt, Win, etc. on PCs) with various keys to produce unique sequences.My only request is that word expansion could work across all open files, like it does in Vim, rather than just the current file. Virtualenv and Pip support are woven into PyCharm, and both work pretty well. When you first open a directory of Python code, the editor warns you that the project lacks a Python interpreter. At that point you can choose to use the system Python or a virtualenv Python. PyCharm detects several types of errors in your code and will offer to fix them for you through the Intention Action feature. These include the types of errors that you probably already use pylint to check for in your editor of choice: syntax errors and PEP8 violations. It also detects spelling mistakes with what appears to be a very limited dictionary. Of all the use I have made of Pycharm is the only applications that I have never found anything I liked less. Yes it has a paid license but for an application with the quality that JetBrain has and with the support that the applications have was impossible to be free. I use Pycharm to develop all my projects in Python, both professionally and personally. Once you start using PyCharm, you can hardly trade for another. The clean user experience helps developer to focus on developing task and being less distracted. At the same time this IDE provides a way to achieve almost everything a developer would expect to do in one way or another. Though it is easy to start off coding on this IDE, learning and getting the most of it needs a good amount of time to pass its steep learning curve. To my knowledge it is the best alternative in IDEs for python development. If you are a student you can get a educational license freely too! I use it for developing Bioinformatics research softwares for our research lab. In addition to the UX-centered coding environment it provides, its functionality on code performance analysis and code deployment makes it a perfect choice when developing more robust software components matter as it is our case. the tool is somewhat heavy compared to other python IDE out there and not the best option for a small project. the tolls isn't cheap and everyone cant afford it. this probably the best IDE out there even thou its a little bit costly. i used it to code and debug python scripts. "Way better code suggestions than the alternatives have "
I like how Pycharm has code autocomplete and syntax highlighting. Also, it provides a lot of convenience: you can refactor methods and find usages quite nicely. Importantly, it makes debugging much better. Finally, it can support different run configurations. Lack of built-in memory profiler. Also, it is a bit heavyweight, especially if you just want to edit a single file. Pycharm solves the problem of providing a software development framework that minimizes mistakes. For instance, I could edit files by hand easily with vim or nano, but I would much more likely make mistakes when doing this. The code complete, syntax highlighting and refactoring methods all help reduce the likelihood of error, helping software get shipped faster and with fewer bugs. The other features like environment management, run configuration, debugging are nice as well. I realize that an IDE like PyCharm breaks the unix philosophy: Make each program do one thing well. But I have to say this program breaks that rule exceptionally well. It's syntax highlighting, linting, and autocomplete of python/django code would probably be enough for me to like PyCharm. It indexes your code base (including the virtual environment) and can do things like autocomplete model names that are provided as strings to models.ForeignKey(), let you cmd + click function/class names to jump to their definitions, and warn against pep8 violations with squiggle underlines (like spell checkers). But having it run the server in one panel, my terminal in another, and a python console in yet another means all the things I need while I work are at my finger tips. So even though PyCharm breaks the unix philosophy, it frees me to focus on doing just one thing well: build the internet. I love open source software, and PyCharm is not. However, they annually sponsor the Django Foundation with a fundraising drive and they have a free community edition that's awesome for people just learning. It's also worth noting that most professionals use professionally built close source software that they pay for: photoshop, autocad, etc. So even though I would like an open source PyCharm, that isn't the current norm. As with most IDEs like PyCharm, they are monster codebases. So PyCharm can be slow at times and it certainly uses a good deal of memory. I solve that problem with lots of expensive hardware. But on systems with only 4 or 8GB of memory you might notice slowness. Especially when launching a project or indexing a project (like when you pipenv update). PyCharm Pro is expensive as editors go, but for a professional it's worth the money. Try the free version (lacks django integration) before spending your money. Web development with most of your daily tools you could ever wantjust a keyboard shortcut away. Pycharm IDE is basic text editor and little bit more advanced.it contains lots of tools and that will be help on coding. pycharm saves lots of time and we can write code in easy way compare to other editors. The best thing is pycharm community edition is free and open source software. After starting up pycharm,it will take more than one minute to load. some times hangs when ever we are working with heavy data files. pycharm wants to restart to see what changes made in codes. The pycharm has a large memory occupation. pycharm is one of the best IDE to write python code. pycharm community edition is free. I use pycharm for data visualization by using matplotlib and data analytics. the pycharm provides to user code re-usability which will help to do some modifications. 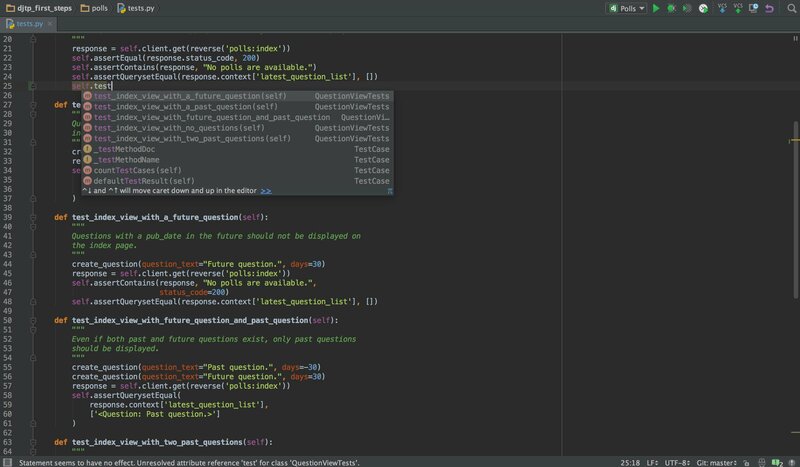 pycharm makes complex code in easy way by using modules. "Superb IDE for Python development"
Lots of things which I like about this IDE like code inspection, autocompletion, type checking and all. But the one thing which I like the most is its debugging tool which helped me a lot and to my team as well in debugging the application faster way. It also has good amount of plugins which helped me in adding more features. Apart from that, it has very good database integration support and in-built Git version control support which is an added advantage. It also has in-built terminal which helped me in executing commands from IDE only. Although it has very good support for Python language and other frameworks like Django, it doesn't have good support for Java language. Moreover, it takes a lot of memory to run due to which sometimes it stops working and you need to restart it to make it work. You would like it as soon as you will start using this IDE. It is one of the best IDE available for Python development. If you have money concern, then you can go for its community edition which is free. I have been using it for automating the project in Python language. It helped me in developing quicker and easier testing and debugging the application. "JetBrains for Python, what more could you want?" Is it unfair to say "Just about everything"? Everything from the layout to the code completion, from the project navigation to code analysis, it's all excellent. You have access to all of the wonderful tools that you would expect from a JetBrains product. Debugging panel, built-in console, VCS integration, run configurations, add-ons, strong refactoring tools, automated code optimization, stacktrace analysis, and tons and tons of customization. And of course it's incredibly stable, haven't had a single crash ever. Sometimes when using external libraries you can run into some weird, non-intuitive issues with code completion and source navigation. Other than that, I haven't had any real issues. If you like any of JetBrains' other IDE's, just get it! Saves a lot of time doing basic repetitive tasks such as data pulling/entry and validation. This way our time is better spent on tasks that actually require the attention of a real human. We currently do not use Python for client-facing or mission-critical programs but with the help of PyCharm I certainly have more faith in using it for those applications. "PyCharm deeply understands your code"
Pycharm is the best tool for python development. Here are some features which are more interesting in Pycharm like auto-completion,code generation, syntax highlighting, error correction. It also provides database tools. It plugins the packages of different languages so a developer which has more skills he can code in more than one language on a single IDE. It also supports anaconda distribution. It is heavy software which uses more resources so, It requires a good processor. It is not freely available. I would highly recommend it to others because it provides all the features which a developer wants during development. Since it supports the Anaconda distribution so we can import all the python libraries and make the project in python. And can also visualize the data from the datasets. "The only python IDE I use"
Lots of features and a powerful refactoring tool, it integrates with docker and virtualenvs and it has an integrated terminal in case you're old fashioned and need to run some stuff in the shell. Read the full docs at least once, but don't try to memorize everything, you'll get used to it and start using more and more features with time. Programming, refactoring and software development. inability to run a part of the code in other that the console regime; inadequate support in installing third-party packages; sometimes I have difficulties in installing transferring packages for using in the other IDEs. For the unexperienced users, I'd recommend using community version instead of the professional one. Don't ignore customization opportunities. If you're working in python in the other IDE, you don't need to install all the packages again - just use old software (like anaconda) in the background. Also, you can easily switch between virtual environments in the working directory. So, pycharm provides a lot of useful tools in switched to the software from its competitors. - I managed to run the development server inside PyCharm but I still have to deploy to GAE manually. - in some cases it can't seem to figure out the dependencies on libraries vendored into the app (i.e. exactly as the GAE SDK does) so completion/lookups don't work. I got used to it, tho. Best thing I like about this IDE is it gives full support for Python development which means you don't have to download basic libraries to make it work. Those are pre-installed. It has built-in Python terminal which helps me to do coding and testing the application without leaving the IDE. Apart from it, it has very good support of version control system like Git. More than that it even allows me to stash my existing changes which is very useful for me because I don't have to switch to another application like SourceTree for stashing the changes. It allows you to create patch file of existing source code changes which you can transfer it to another developer for using it. Debugging the application is very good which helped me in debugging the application to identify the root cause of the issue. It requires lot of resource to run. Due to this, sometimes PyCharm lags if your machine doesn't have enough RAM. Apart from it, there is nothing much which I don't like about PyCharm. If you want to develop application in Python then this is the best IDE available for you. I have been using this IDE for the development of application in Python. It helped me in developing and debugging the application faster. "One of the best IDE for Python Development"
- Ram Consumption is also large but no problem for 16 GB memory users or more. If you are python developer than I don't have to say anything, I know you will already be using PyCharm. Those who are confused then you should give a try to pycharm you won't regret it for sure. I used pycharm in my college days and sometimes these days also. I used to create different projects in college and now I sometimes do freelancing projects in python and I generally use pycharm as IDE. "Time Saver for Python Development"
I am a Java developer, but developed a few of my projects in Python as well. Since PyCharm is the only IDE I used for all of my Python projects, I don't have experience with other IDE's. However, I would say PyCharm is such a time saver for python development. Pycharm is a complete IDE for software development. With the support if various useful plugin, it makes it very easy to program Django and Flask applications. I have used JetBrains other IDE's for Java development and PyCharm looks like any other JetBrains tool, that means most of the shortcuts, layout etc. are same as other JetBrain IDE. Pycharm has greater ecosystem of users and you can find help easier. Library dependancy and installation is always a pain in Python. I always face version mismatch issues. I used Anaconda to handle library dependancies and linked my anaconda with PyCharm that saved a lot of time and efforts. Since I don't have experience with other Python IDE, so I can't compare, but I would definitely recommend PyCharm. I use PyCharm to develop projects in Python. when compared to other IDE's this one doesn't support R, which is not an issue when looking from the point of a python IDE. the version requires payments and there are many free IDE's available for your use. the program is a full IDE which means it needs lots of resources to work fluently. I highly recommend pycharm if you want to take your python coding to next level. Pycharm is an IDE for python and probably the best in the world. "PyCharm - The best Python IDE I've used"
My favourite feature of PyCharm is the autocompletion for 3rd party libraries. It's saved me a ridicilous amount of time being able to see available functions and parameters, especially when working with an external library like Qt (PySide) for doing GUI work. It's also great for working on projects, as it organizes files in their own folder, each with its own project file like any other popular IDE. PyCharm also supports syntax highlighting, spelling correction, PEP-8 specification checks, code folding and auto-indentation. It also has a built in debugger and log window, which is great for locating bugs and checking output. Did I mention it's also free? Yup, give it a go. Sometimes you just want to work on a single file without a project, which is possible, but it's not as straight forward as it could be. The interface can be a little confusing at first, but you'll soon realise you probably won't need to touch the majority of the buttons and menus it presents you with. I would considering using PyCharm if you want a cost-effective IDE for quick and efficient Python development. Writing code is made 10 times easier with 3rd-party library auto-completion support, something I wouldn't want to live without! I have used PyCharm to build the python-based testing framework and IDE for our main software product. It's features have enabled me to rapidly prototype and build a working test system in under 6 months. 1. A good tool to code and run my python code. 2. I love the debugging feature of this tool that allows me to solve the errors. 3. pycharm is a good IDE unlike some of the other tool where we have to code manually, whereas in pycharm most of the terms are auto-filed or highlighted, which makes the task very easy as a coder. 4. Another noteworthy point is that pycharm lets you jump to a function directly by clicking on it. 5. pycharm also lets you edit multiple configuration on it, which means that i could run a small block of code on multiple configuration thus making the testing easier. Initially when i had installed this software i had some issues with version mismatch of the interpreter which cost be couple of days to fix. 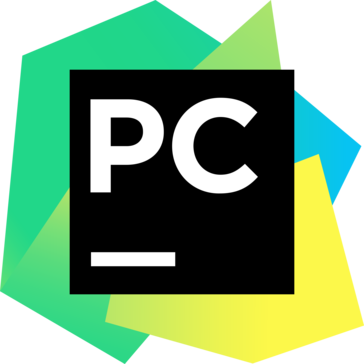 try the free version of pycharm before jumping into buying the professional one. It is a good tool to code in python. I use pycharm for my Motion Planning and Artificial Intelligence courses on the free version and it serves the purpose pretty well. From what i have heard and seen, this tool is pretty popular among professional for software development and programming.